In the manga this was the section that first showed what stands in Stardust Crusaders could do. It was an excellent fight between two important characters. So will the anime live up to that previously amazing setting? Well, it has so far. Jotaro heads off to school with his newfound powers. Why? Apparently the Speedwagon Foundation has not set everything up yet and we need a reason to meet a new character. 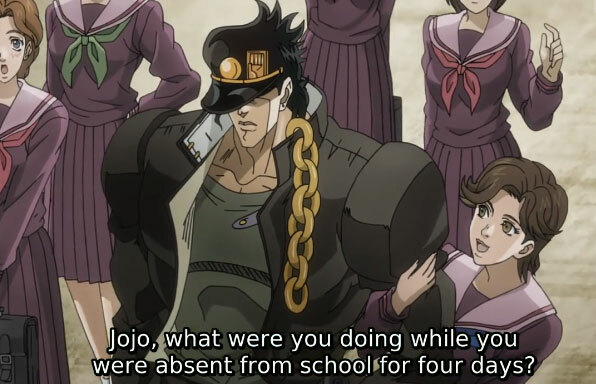 Jotaro is going through his usual day of being pestered by girls who love bad boys when he is attacked. Jotaro is blasted by something and knocked down some stairs, apparently at the command of a green-coated man at the top of the stairs. He introduces himself as Kakyoin and hands Jojo a handkerchief to clean up with. While getting his leg checked out the female doctor starts acting extremely strangely. She even attacks a student with a pen and Jojo does not react in time to save him. It’s then revealed she is being controlled from the inside by Kakyoin’s stand. Also in one of the strangest parts of this series Jotaro didn’t bother to read a death threat on the handkerchief. In a horrifying fight Jojo removes the stand but severely injures the innocent doctor in the process. 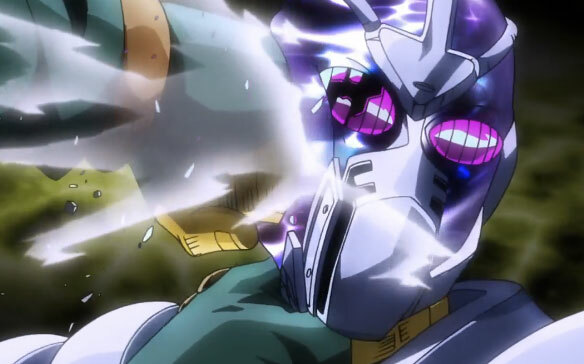 Kakyoin reveals his stand can also fire off an “Emerald Splash” as an incredibly fast projectile. 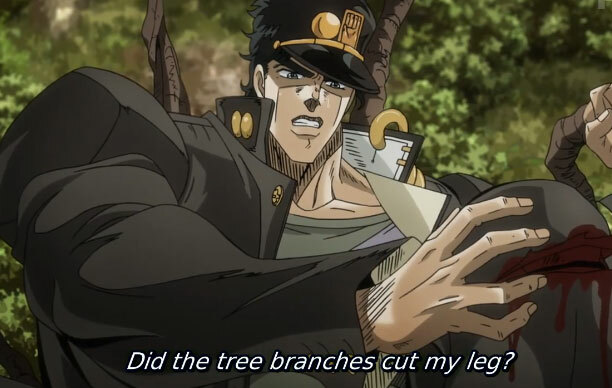 Fortunately Jotaro can handle the minor damage it deals him. He smashes Kakyoin with relative ease. Jotaro takes his enemy back to Joseph, who reveals that Dio did something to him and the episode ends on the cliffhanger. We won’t spoil it for those who haven’t read the manga. For those unfamiliar with Araki’s previous work the mangaka for this series had previously done some horror work. This part of the manga and the anime denote a marked turn towards horror for the series. Later on you’ll see equally creepy things with some future villains and the horror will continue in four. 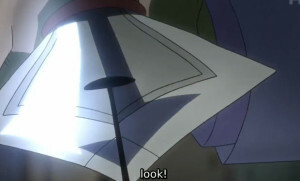 The anime really handled the CG well this time and the skills of the animators have improved significantly. The CG is not perfect still but looks more natural and works with the sheer craziness of stands. So far they are still doing an excellent job. The only unfortunate part of it was that there is no excellent ending song yet. We hope to hear one soon. 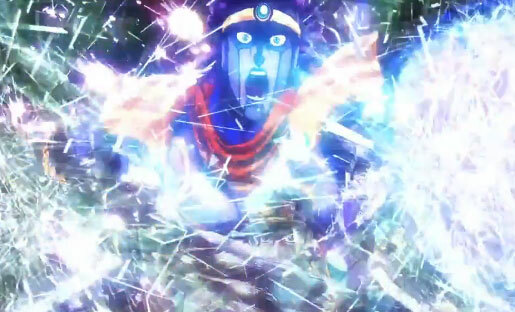 Jojos bizarre adventure is getting crazier and crazier each episode. i wished i knew about jojos earlier!